With the dust now settling from the widely anticipated USDA report, let’s take a minute and dig into the numbers. First on the list is corn – USDA published quarterly stocks as of March 1st as 8.616 billion bushels. The average estimate was 8.534 and the range was 8.2-8.9. It was on the ‘upper-end’ of the range and is considered to be a bearish number. A bigger stocks estimate implies a drag in feed demand. The four quarterly stocks reports are the only snapshot we get into feed demand per year from the USDA (and even these are implied). Currently, corn futures are trading higher – that is due to a friendly acreage estimate. 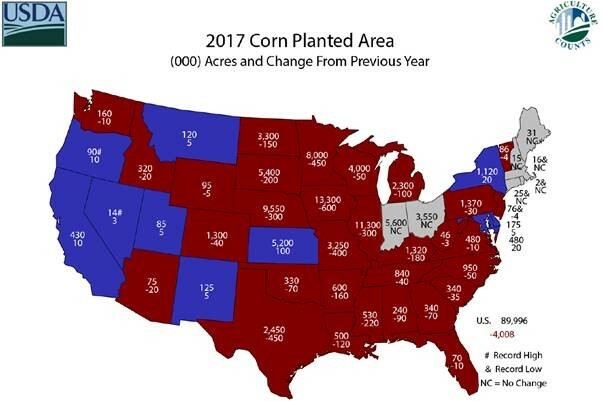 USDA estimates that we will plant 90 mln acres of corn this coming spring. That is about 1 mln below the avg. trade estimate and at the bottom end of the expected range. Last year, we planted 94 mln acres. Year-on-year, that is a 4.25% drop in acreage. There isn’t much bias for change in acres between the March report and June report. USDA estimates Iowa to plant 13.3 mln acres of corn (down 600k from last year). Now, for the world’s most popular oilseed – soybeans. USDA estimates that U.S. stocks on March 1st were 1.735 billion bushels. The average estimate was 1.684 with a range of 1.62-1.88. This, like corn stocks, is a ‘weighty’ number. In the case of soybeans, the U.S. is entering a stage of diminishing exports. Adding to the pressure is a growing (and by all measures) record soybean crop in Brazil. 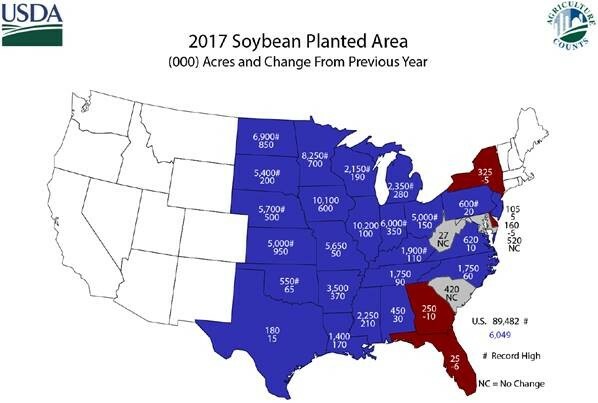 The biggest story today is soybean acres. USDA estimates soybean acres at 89.5 mln. The average estimate was 88.2 and the range was 86.4 to 89.3. There seems to be a bias that acre estimates grow between the March and June reports. The market is admitting to the growing likelihood of another large U.S. soybean crop. The infamous July:Nov soybean spread traded as high as a 65c inverse in January. As of this writing, it is a 2c inverse. As the trade looks to the forward curve, we can see it anticipating a large soybean crop through weakening futures spreads. USDA estimates Iowa to plant 10.1 mln acres of soybeans (up 600k from last year). Wheat stocks and acres were generally neutral to friendly. As expected, wheat acres in Iowa are unchanged. Now what? Well, we are now entering the season of “too’s”. Too wet, too dry, too hot, too cold (read – volatility). As our neighbors in the southern hemisphere press on with a record harvest, traders will turn their focus to U.S. planting and early season weather. For corn, with planted acreage expected to be lower, this humble trader expects more volatility. For soybeans, any bullish news will have to deal with a (very) heavy balance sheet.